The Obama Administration’s drilling moratorium announcement is a start, but doesn’t translate into real relief for Gulf Coast businesses and residents who rely on the energy industry for their livelihood. Companies who are in compliance with new rules are likely to face lengthy delays for permits. As long as this permitting moratorium continues to exist, there is an increasing strain on Gulf Coast businesses and independent operators that are struggling to keep their doors open. Until we see new permits issued to allow drilling to go forward, jobs are not being saved or created, revenue for the Gulf region is not being generated, and much-needed domestic energy resources are not being tapped. 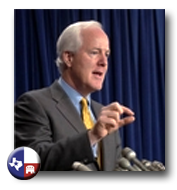 Cornyn should find a microphone and go ballistic on this; some radio show. The Chinese, and everyone else is drilling off our shores. I think this kind of thing motivates our base if given voice; a press release doesn't quite cut it, in my opinion.